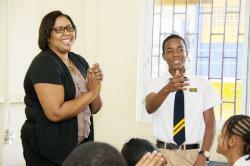 Sagicor Life Jamaica has sponsored St. Elizabeth Technical High School’s (STETHS) participation in the 2012 – 2013 Junior Achievement Company Programme. The annual initiative provides students with firsthand experience in operating a business and has attracted approximately 40 schools across the island this year; up from the initial five schools in 2008, when the programme began. The Junior Achievement Company Programme is supported by USAID and executed by the local chapter of the 91year old Junior Achievement Worldwide; and is in keeping with the secondary curriculum sanctioned by the Ministry of Education - who remains a partner since its inception. Andrea Beaumont-Kelly, Advisor of the Junior Achievement Company Programme at STETHS is delighted to have Sagicor’s support for 2012 – 2013. “This is the second year that STETHS is participating. It was a challenge working without a sponsor last year and this year the students are very receptive to the advice coming from the various representatives of Sagicor,” she expressed. Junior Achievement Worldwide involves 43 countries across the globe – including Jamaica. Locally, over 700 hundred students make up this year’s programme. Sagicor Life Jamaica Limited is the leading life insurance group in the country. The company commenced operations in 1970 as Life of Jamaica Limited, the first locally owned life insurance company and the first life insurance company to be listed on the Jamaica Stock Exchange (JSE). Since its inception, Sagicor Life has gained a solid reputation as an innovator and leader in the Caribbean life insurance industry. The company continues to be the market leader among local life insurance companies.